Recall the most memorable toys of your childhood and chances are at least some of them belong to the Mattel family: Barbie and American Girl dolls, Hot Wheels and Matchbox cars, and Fisher-Price toys, among them. The top toymaker in the world, Mattel operates on the belief that every child has a fundamental right to play – a right that the United Nations itself has endorsed. Along with the millions of toys that it sells, the company supports that vision of universal play through the work of the Mattel Children’s Foundation and its other philanthropic endeavors. The foundation’s role is to uphold and extend Mattel’s “legacy of inspiring wonder and bringing play experiences to children all around the world,” according to executive director Nancy Molenda. For years, Mattel has partnered with Good360 to bring that imaginative world to life for children in need. In 2018 alone, Mattel donated more than $2 million worth of toys through Good360, helping to serve more than 230 nonprofits. In January, the company collaborated with several other Good360 partners to bring 15,000 toys to children in Puerto Rico, as their families struggle to recover from the historic devastation of Hurricane Maria in 2017. On a smaller scale, Mattel toys have found their way to numerous nonprofits in our network. Last year, the company donated 100 Barbie dolls to Kids Korna, which helps youths facing violence and abuse in Chicago. 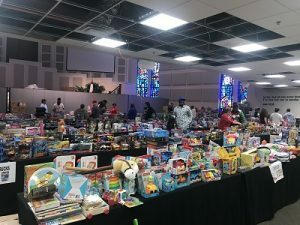 Barbies also played an important role for a donation that went to Emergency Infant Services, a Tulsa, Oklahoma-based nonprofit organization meeting the basic human needs of infants and children under six years old whose families are in financial crisis. It’s stories like these that show how the power of play can be transformative, Molenda says. From in-kind giving to employee volunteerism to grant making, Mattel sees play at the heart of everything that it does. Also in 2018, Mattel hosted its first ever “Global Day of Play,” in which more than 1,000 employees organized play experiences for more than 5,500 kids at 28 Mattel locations around the world. It’s this heartfelt vision that has kept Molenda working at Mattel all of these years, rising from a company event planner to leading the Mattel Children’s Foundation. Register with Good360 to become a part of our Circle of Good that includes companies, charities and individuals working together to make the business of giving simpler, more efficient and more effective.